From Nov. 15 through Nov. 26, 2005 Lotte Hotel Seoul's very stylish La Seine buffet restaurant, and Delica-Han Sidewalk café & Delicatessen will present the "Sweets from Istanbul" especially introducing Turkish desserts prepared by an authentic Turkish pastry chef. Turkey is well-known for its exquisite desserts and Turkish desserts are characteristically sweet, and usually prepared with peanuts, syrups and wheat cakes. 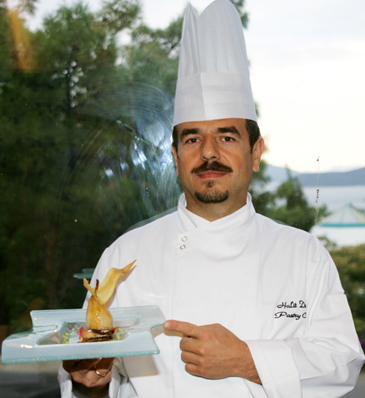 For the promotion, Chef Halit Demir of the renowned "Hapmag Sea Garden Hotel & Resort" in Turkey, will visit and feature 15 kinds of local desserts including "Asure," and "Muhalleby" both representative Turkish desserts. The desserts will be offered at the Dessert Corner of La Seine and are available for retail sales at Delica-Hans. La Seine's Luncheon Prices are \48,000 for adults and \28,000 for children, and Dinner is \53,000 for adults and \30,000 for children. Prices include VAT and Service Charge.